New Delhi: In a setback to Reliance Natural Resources Ltd (RNRL), the Supreme Court on Thursday allowed the ministry of petroleum and natural gas to become party to the ongoing dispute over gas supplies between the Ambani brothers. RNRL counsel Ram Jethmalani had on Tuesday opposed the government joining the case on the grounds that the petroleum ministry was not a party to the dispute between Mukesh Ambani-controlled Reliance Industries Ltd (RIL) and Anil Ambani’s RNRL. The ministry’s SLP against the Bombay high court judgement of 15 June says the ruling had adversely affected the government’s sovereign rights over natural gas and undermined the PSC and the government’s gas pricing policy. Interestingly, the Bombay high court had allowed the government to “intervene" in the case. An “intervenor" can only make written submissions, but a party can make oral arguments besides filing replies and counter-affidavits. Jethmalani had said on Tuesday that the government had no right to maintain the SLP and that if this was allowed then he should be permitted to cross examine petroleum ministry witnesses in the case. When Jethmalani again raised the issue of cross examination on Thursday, the three-judge bench reminded him that the case is being argued through affidavits. Any party that has objections to the filings can file a counter-affidavit. Jethmalani subsequently relented on the government becoming a party, saying that RNRL wanted to avoid prolonging the case. “I am consenting not because they have a right to (but) because I want to avoid further litigation by the government," the RNRL counsel told the bench of Chief Justice K.G. Balakrishnan, justice B. Sudershan Reddy and justice P. Sathasivam. An RNRL spokesperson sought to downplay the change of stance in a late evening statement. “There is no formal order and we consent to the government being a party subject to inspection, discovery of documents and cross examination," he said. RIL counsel Harish Salve said outside the court that his client’s stand had been upheld. “We have always maintained that the government should be a party to this as we would have to deal with the government after the judgement," Salve said. 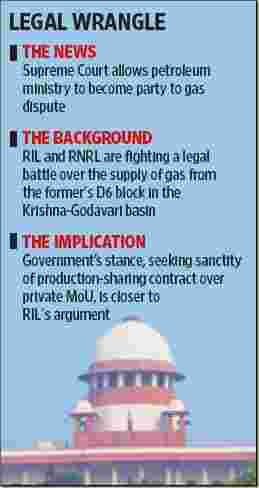 The Supreme Court is hearing the case between RIL and RNRL over the supply of gas from the former’s D6 block in the Krishna-Godavari (KG) basin. While RNRL has sought the apex court’s intervention in an SLP for immediate supply of 28 million standard cu. m a day (mscmd) of gas from KG D6 at $2.34 (Rs108.58) per million British thermal units (mmBtu) for a period of 17 years, RIL has opposed this, saying the price is 44% lower than that mandated by the government and that it cannot supply gas at a price not approved by the government and to a user not listed in its gas utilization policy. In another development, Gopal Subramanium, solicitor general of India, clarified that he has been instructed by the petroleum ministry as also the Union government to clarify in the Supreme Court that the interests of state-owned power utility NTPC Ltd have not been jettisoned. The NTPC suit in the Bombay high court, seeking supply of gas at $2.34 per unit, should not be prejudiced in any manner by the RIL-RNRL dispute, Subramanium said. The solicitor general acceded to the request of the three-judge bench to file an affidavit on the government’s stand on NTPC. The petroleum ministry had clarified its stand in an amended petition on 1 September, and said: “It is the unequivocal stand of Union of India that the approval of the price of gas at US$4.2 (per) mmBtu in respect of the D6 block was without prejudice to the rights of NTPC in the pending suit filed by it against RIL pending before the Bombay high court." The lawsuit between NTPC and RIL in the Bombay high court dates back to December 2005, with the point of contention being the existence and terms of a valid contract between the two. NTPC claims there is a contract in which RIL promised to supply 12 mscmd of gas for the expansion of the state-owned power generator’s Kawas and Gandhar power plants, both in Gujarat, for 17 years at a price of $2.34 (nearly Rs114) per mmBtu. RIL claims otherwise. Mohan Parasaran, additional solicitor general, arguing on behalf of the petroleum ministry, said NTPC was a government nominee and would follow state policy. Any agreement that runs contrary to the PSC, to law and is against the public interest cannot be held as valid by the court, he added. Under the government’s National Exploration and Licensing Policy, 203 PSCs have been signed. The Bombay high court order could jeopardize all these contracts if private MoUs are privileged above the PSC, he said.